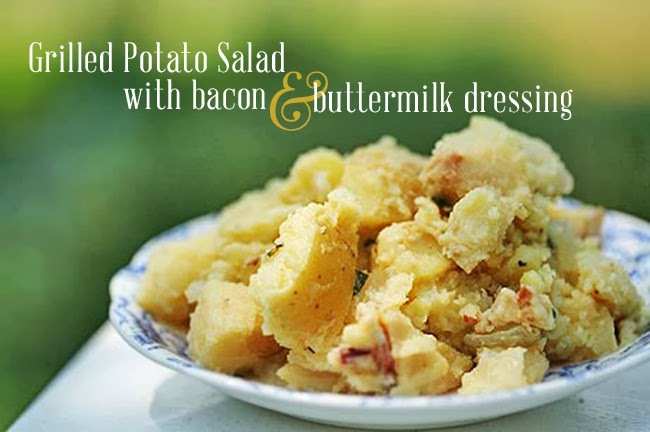 I was so excited to try this new potato salad recipe from (my favorite) Bobby Flay, that I actually insisted that I be able to make it for my Mother's Day picnic. Let me give a little disclaimer here... I did make it on Saturday since Sunday was a no-cooking zone at my house. I was so glad that I did, because the results were fabulous. So tasty! Put the potatoes in a pot of salted cold water and bring to a boil. Reduce the heat and simmer until the potatoes are tender but not cooked through, about 8 minutes. Drain the potatoes and let cool before cutting in half. While the potatoes are cooking, cook the bacon in a large saute pan over medium heat until golden brown and crisp, 8 -10 minutes. Remove the bacon and drain on a paper towel. Whisk together the buttermilk, mayonnaise, sour cream, and mustard, in a large bowl. Season with salt, pepper, onion & garlic powders. Heat your grill to Medium. Brush the potatoes on both sides with the oil and season with salt and pepper. Place the potatoes on the grill, cut side down and grill until lightly golden brown, about 3 minutes. Turn the potatoes over and continue grilling until just cooked through, about 3 minutes longer. Image from here... while mine tasted good (and looked good)... the picture? Well, I'm no food stylist.